You don’t have to tell us twice, we know robocalls are annoying. Our Robocall Challenge generated advice we wanted to share, from consumers who say they’re using certain tricks to stop these harassing calls now. On May 8th, FTC staff are conducting a mobile cramming roundtable among consumer advocates, industry leaders and government regulators. The roundtable is part of an ongoing effort by the FTC to address how to protect consumers against the growing problem of mobile cramming. Is there an older person in your life who’s worried about identity theft? Or perhaps you’re the one who’s worried about what’s happening with their identity? Either way, we hope you’ll join us at our upcoming forum, “Senior Identity Theft: A Problem in this Day and Age,” Tuesday, May 7, 2013, 9:00 - 4:30. You can come in person or join via webcast – all the details and the agenda are here. 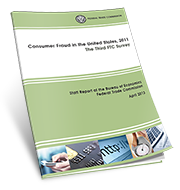 The FTC is always working to know more about the types of fraud being committed and who spends money on them. Consumers provide us with useful information through periodic surveys that ask them to share the important details about their recent marketplace experiences and a bit about themselves. After the bombing at the Boston Marathon, many people are looking for ways to help, like donating to a charity or fund. Doing some research first will help ensure that your donation will go to a reputable organization that will use the money as promised — and as you intend. Is Your Mobile Bill a Cram Sandwich? People have long complained about unauthorized charges — cramming — on the bills for their landlines. The FTC has responded loudly and clearly, bringing more than 30 cases, getting tens of millions of dollars back for consumers, and advocating for reforms to eliminate landline cramming. But fraudsters, trolling for new opportunities to cheat consumers, have found the bills for people's mobile devices to be fertile territory. 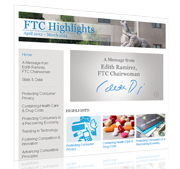 Springtime: For us here at FTC headquarters, it means warm weather, cherry blossoms on the National Mall, and the publication of the agency’s Annual Highlights.